Apple Mail offers useful but limited automation and filing features. Email power users who need more advanced capabilities can enhance and expand Mail’s tools with a plug-in from Indev called Mail Act-On. Mail Act-On lets you file any message in any mailbox quickly using the keyboard (and without any advance setup or tedious memorization). It also extends Mail’s rules with Act-On rules (which you can apply to any message with a custom keystroke) and Outbox rules (which apply to messages as you’re sending them), providing a wide range of automation opportunities. 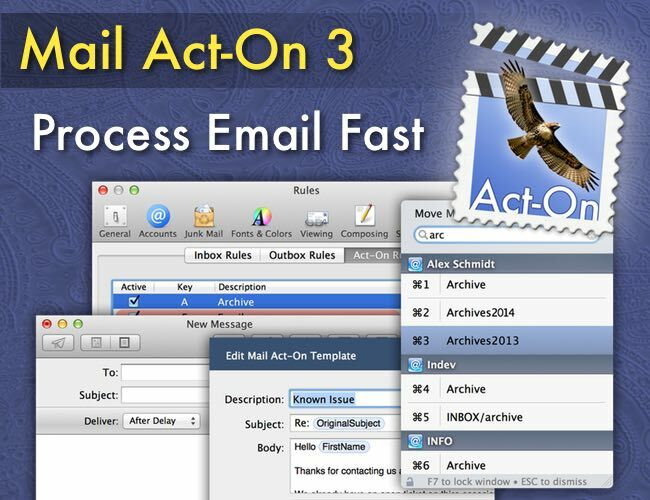 Try Mail Act-On with a 30-day free trial today. Our thanks to InDev Software for again sponsoring the site to promote Mail Act-on. Their two plugins for Apple Mail (MailTagsand Mail Act-On) are best-in-class. Highly recommended if you use Apple Mail but wish it were more capable, clever, and just generally more friendly for power users.